Remember just a few months ago when Scott Walker was just a little-known gubernatorial hopeful from the Cheese State with an inexplicable hatred for trains? It was no secret that he had some unusual ideas, his fanatical opposition to passenger rail being one of them. But who’d have thought that very same man, just a few months into his governorship, would be catapulted into the national spotlight as his state legislature devolved into chaos? 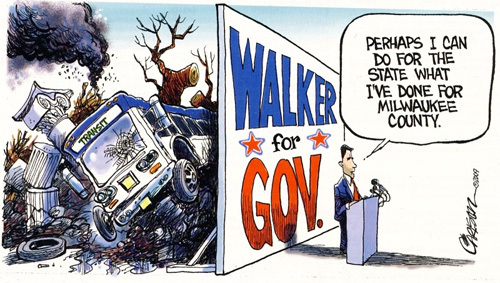 It was nearly four years ago to the day that Scott Walker told the Milwaukee Journal Sentinel editorial board that he wanted to grow the economy so much that poor people would be able to buy cars and leave the bus behind. Walker’s outlandish ideas about transit appear to have carried over to his controversial state budget proposal. The same document that has ignited a collective bargaining battle and captured the nation’s attention also includes catastrophic transit cuts totaling $46 million. So as we prepare for deep state revenue sharing cuts to local transit systems (“we’re broke, we can’t afford transit…) and perhaps the ending of some federal transit aids if Walker’s budget-repair bill strips bargaining rights from local system employees, remember that he was mouthing his marketplace talking points years before he had a chance to translate them into real-world service cuts. Also on the Network today: Greater Greater Washington reports that a pair of anti-livability bills making their way through the Virginia legislature have — thankfully — been laid to rest. We reported earlier that these two bills would have required that highway construction take priority in Northern Virginia and that all transportation projects be evaluated first-and-foremost for their effect on congestion. The legislation was championed by an interest group representing construction, real estate and business interests and was a major threat for Arlington County, which boasts one of the most progressive county transportation departments in the country.